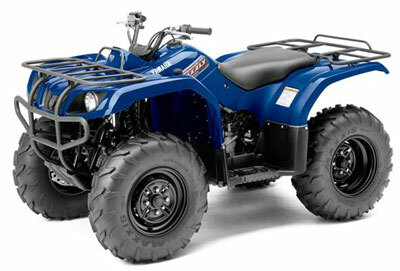 For 2013, the Grizzly ATV designation applies to all the utility style Yamaha ATVs. From the entry level 125 to the top 700 SE, they're all Grizzlies now. Other than the name, about the only thing they all have in common are standard front and rear cargo racks and automatic transmissions. We'll cover each 2013 model in the Grizzly ATV line with a brief overview, specs, and the type of rider each is best suited for. Entry level Grizzly 125 features cargo racks, electric start, and automatic transmission. The 125 Grizzly is really a step above most entry level ATVs, but it is the smallest utility ATV in the Yamaha line. We wouldn't call it a youth ATV, but with it's standard throttle limiter, it would be a reasonable choice for larger kids, along with small adults. The medium sized frame should be comfortable for those riders, and the electric start and automatic transmission make it easy to ride for beginners. Continuing with that theme, the air cooled 4 stroke engine produces docile, but adequate power, and the sealed drum brakes seem fine for this type of ATV. The steel racks are functional, though the 33 pound capacity won't put the little Grizzly in the pack mule category. The little more than 5.5 inch ground clearance and 3 inch wheel travel at both ends aren't going to allow you to get too crazy anyway. So even though the 125 Grizzly may look like a utility ATV, it's really more about being an easy to ride, simple to maintain ATV for beginners. It seems a little pricey, but Yamaha ATVs are known for reliability so it should retain more value than most. If the 125 seems a little pricey, the Grizzly 300 looks like a screamin' deal! An extra $500 gets you a liquid cooled 287cc engine, dual range automatic transmission, bigger frame, front and rear disc brakes, shaft drive, about twice as much suspension travel, and 143 pound rack capacity. As two wheel drive utility ATVs go, this one is serious. 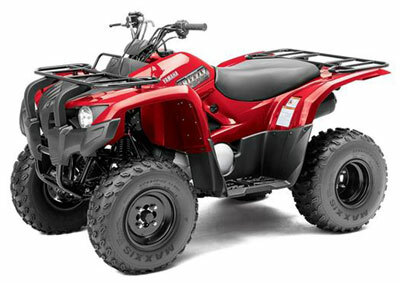 If you're looking for a solid ATV that can work and play equally well, the Grizzly 300 should be on the short list. And at that price, it should be included on a Best Value list too! The 350 Grizzly is a big step up in price and capability. A solid rear axle, capable engine, and 4 wheel drive make for a work horse of a mid size utility ATV. The air cooled engine is simple and easy to maintain, but has good low end power. 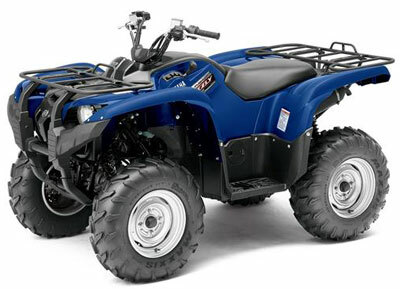 The 350 has the excellent Yamaha "Ultramatic transmission with push button 4 wheel drive. This smallest 4 wheel drive Grizzly is ready to work with a standard trailer hitch with an 1100 pound towing capacity, and steel racks with a combined rating of over 250 pounds. But even though the 350 is biased toward utility, it's small and light enough to be very maneuverable for most trail riding. Suspension travel and ground clearance is good enough for all but the most demanding terrain. The 450 is an even bigger step up in price as you enter the world of 4 wheel independent suspension, 4 wheel drive, and more big boy features. The liquid cooled engine includes a counter balancer for extra smoothness and riding comfort. It also features a 45 degree mounted cylinder for a lower sear height and center of gravity. No fuel injection will be a disappointment for some, but it does help keep the cost down. If you're a smaller rider or on a strict budget, the Grizzly 450 deserves a serious look. It has most of the capability of the 550 in a slightly smaller package and a significantly lower price. And at over 40 pounds lighter, you might not really need the power steering. Rack capacity is a little less, wheel travel is a little less, seat height is a little lower, towing capacity is the same, and ground clearance is the same. You'll also get the best in class Ultramatic transmission just like the 550 and 700. Overall, this mid size Grizzly is biased more toward the utility side of things than the 550 or 700, but it's still perfectly capable of having plenty of fun on just about any trail riding experience. And with a fatter wallet to sit on! 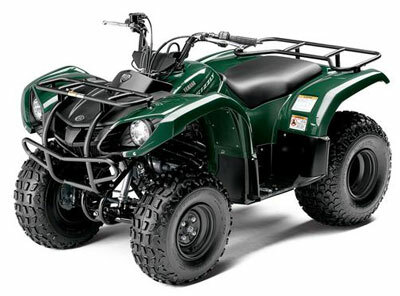 The 550 Grizzly ATV is one of our favorites in the mid size utility class. It's a significant step up in size and ability from the 450, but without completely breaking the bank. And you do get fuel injection along with the larger size, so there is some justification for the higher price. Identical in every way to the Grizzly 700 except for cylinder bore size, the 550 is perfect for folks that don't feel they need the extra power of the 700. Truthfully, at the speeds most riders normally go, most would never know the difference. We've found over the years, that a mid size ATV is usually more manageable and enjoyable to ride than their big bore brothers. If you want the ultimate in an easy to ride all wheel drive utility ATV, this Grizzly ATV with the power steering option will be real tough to beat. It's relatively light and small enough to be maneuverable, yet big enough to be comfortable. It has enough power for just about any chore, but not so much to be intimidating. It has sophisticated features like fuel injection, all wheel drive, the best CVT transmission out there, four wheel independent suspension and all wheel disc brakes. But maybe best of all, it has a great reputation for solid reliability. We highly recommend this mid size Grizzly ATV. So that brings us to the biggest Grizzly ATV in the line, the 700. The biggest difference with the 550 is a 10mm larger bore and $900 more money. Everything else is the same. Is 10mm worth $900? If you want the top of the line Grizzly ATV, we suppose it would be. There is enough more power to notice, although it may be debatable how often the extra power would really be needed. 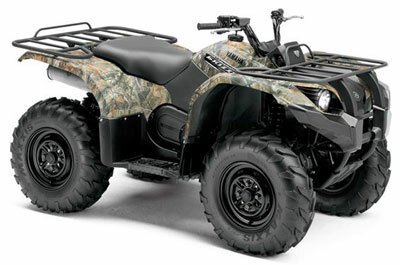 The 700 is one of the smaller and lighter entries in the big bore utility ATV class. In some ways it's more like a mid size on steroids. If you need to fit an ATV in tighter places, but still want or need bigger power, the 700 Grizzly ATV may be what you need. Even though the 700 Grizzly looks like the runt of the litter in the big bore class these days, it's still a great handling and hard working utility ATV that's much less intimidating than some of the overgrown monsters now on the market. If long term reliability, nimble handling, comfortable ride, and easy maintenance are important to you, the 700 Grizzly ATV deserves a serious look. 2013 Grizzly 700 Review and Test.